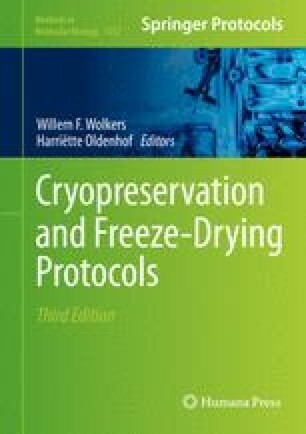 Efficient cryopreservation of human stem cells is crucial for guaranteeing a permanent supply of high-quality cell material for drug discovery or regenerative medicine. Conventionally used protocols usually employing slow freezing rates, however, result in low recovery rates for human pluripotent stem cells due to their complex colony structure. In this chapter, a surface-based vitrification protocol for pluripotent stem cells is presented based on a procedure for human embryonic stem cells developed by Beier et al. (Cryobiology 63:175–185, 2011). This simple and highly efficient cryopreservation method allows cryopreservation of large numbers of ready-to-use adherent cells that maintain pluripotency. The work with human embryonic stem cells was permitted by the Robert Koch Institute (18 and 44 permission) and carried out according to German law.